We’re proud to welcome a special guest columnist: Don Martin’s widow, Norma Haimes Martin. UPDATED 5/18/17: Don Martin would have been 86 today. His widow, Norma, wrote this to commemorate his birthday last year. But it still holds up, so dig it — and BWAP! POIT! 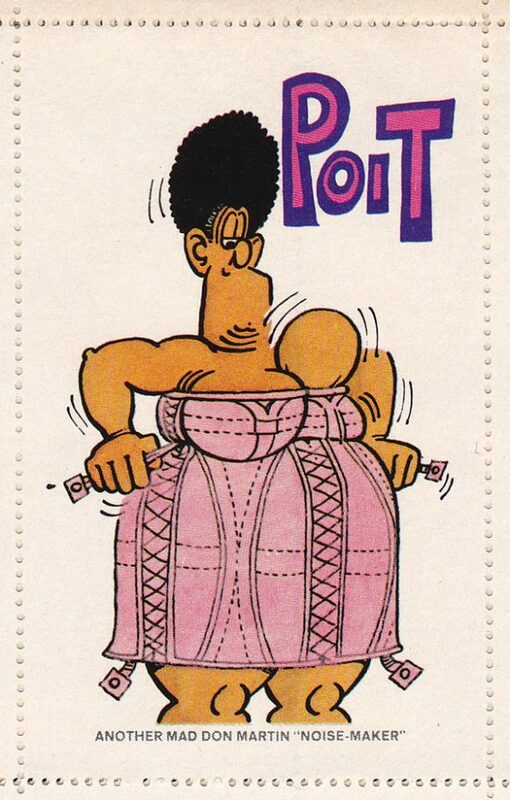 That was my friend Paul Kessin’s favorite Don Martin sound effect — elicited when a woman pulled her corset tight and half of her, shall we say, decolletage was pushed upward with hilarious force. 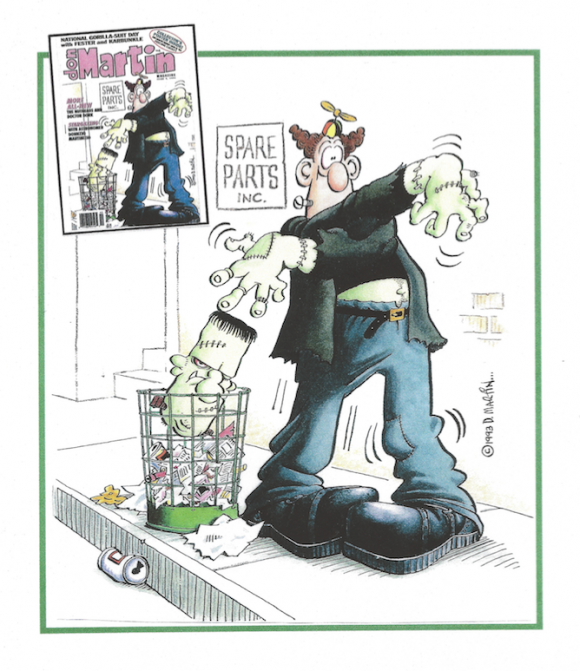 Martin was one of my favorite parts of Mad Magazine. I’m obviously not alone. The cartoonist was one of the mag’s most notable — and bankable — stars from the ’50s to the ’80s, with paperback collection after paperback collection filled with snort-through-the-nose-funny gags. So you might imagine I was kind of bowled over when his widow, Norma Haimes Martin, contacted me to ask if she could put together a remembrance on his birthday, May 18. We do birthday salutes for the living and departed routinely here so I was way, way, way more than willing to cede the floor to the woman who knew him best. Norma wanted not just to pay tribute to Don’s legacy. She also wanted to clarify his feelings about his art, the ownership of it and his relationship with the controversial, late Mad publisher Bill Gaines. So she went through hundreds of pages of his own memoirs and documents and compiled the column you’ll read below. Don Martin was born May 18, 1931. He died January 6, 2000. My lord, did he leave us laughing. Quotes by Martin (and others where noted) with published and unpublished work, compiled by Norma Haimes Martin. I was born in Paterson, N.J. and raised in a nearby town called Brookside. During the Depression, my father bought a 12-room house in the country outside Morristown. It sat on a tree-covered hill and there was a trout stream in front. It was very rural. It was a beautiful area, lush and pretty, with farms, hills and woods. There were dirt roads and our schoolhouse had four rooms with two grades in each one. I always had a dog and it would go with me on long hikes in the woods. All the time I was doing this country-boy stuff, I was also pretty much of a wise guy in school. I used to draw cartoons all the time — break the kids up that way, get them in trouble. Excerpts from an essay about Don Martin in the Florida Lions Eye Bank 1990 Annual Report: “Don has been fighting blindness most of his life. He had a corneal transplant in his right eye this past year (1989). Cornea replacement with tissues from the Florida Lions Eye Bank is (now) a common (and less painful) thing at Bascom Palmer Eye Institute. When the same surgery was performed in 1949, Don was just out of high school; the methods were different from current practices. At 18 years old, Martin spent two weeks in the hospital recovering… the first three days his head was locked between two sandbags to prevent movement. The pain and discomfort couldn’t be ignored… He swore he would never put himself through it again. But he did. Through the use of eyeglasses and contact lenses, Martin kept on cartooning… and his vision has never been better. While living at home I went to art school in Newark for three years. The first two years I was interested in illustration and cartooning. Then for one year I studied fine art there; after that I went to Philadelphia to study at the Pennsylvania Academy of the Fine Arts for another year. For a while I lived at home working at different jobs while I painted and drew. Eventually, I got back into cartooning because I had to make a living. I moved to New York City and worked in an art studio. I (also) sold work to record- and greeting-card companies and science-fiction magazines. My art style went from academic realism to cartoony. One day, encouraged by my boss, I went up to Mad with my portfolio and the editor there liked my work enough to give me an assignment. Mad was the only publication at the time (the early ’50s) that was pointing out the silliness in advertising and television and movies and politics. There weren’t many others doing it in a broad way like that. The drawings that I first brought to them were kind of tight. There was a very tight kind of design quality — I was using a very fine line. They encouraged me to loosen up a little bit and that’s what I did. (Soon) there was all the fame, all the popularity, but there wasn’t that much money. The pocketbooks made ends meet. I was a model kid. I was obedient. (Gaines) saw what he had. He had a real sucker, and he took advantage of him. There is this fatherly thing going on at Mad. I got so deeply involved…all the kids have it to varying degrees. If you did something wrong, like submitting work somewhere else without first showing it to (Al) Feldstein (the editor), the word around the office was, “What is Bill going to say?” It was smothering. At the end of each trip, the artists and writers put together a book for publisher Gaines. People would knock themselves out to do a good job for Daddy… Some of the trips have been fascinating. In Africa there was a scene that looked like it came from an old silent movie. Jerry and three other guys walked down a dirt road, turned the corner and were out of sight. A couple of minutes later they came running back. They were running as fast as they could run — kicking up dust. An elephant was chasing them. An editor of the early Mad Pocket Books was interested in my drawings; so with a friend of mine, a funny guy, we kicked around ideas for a comic book. I lay each panel on a separate sheet, pasted them back-to-back and put them in a notebook. We discovered we had a book. Presented it to the editor and it was accepted. That was my first Mad Pocket Book — in 1961. After that it’s been every two years. More than 10 million have been sold and there are over a dozen foreign editions of most of my books. There are losses and losses that make us weep. 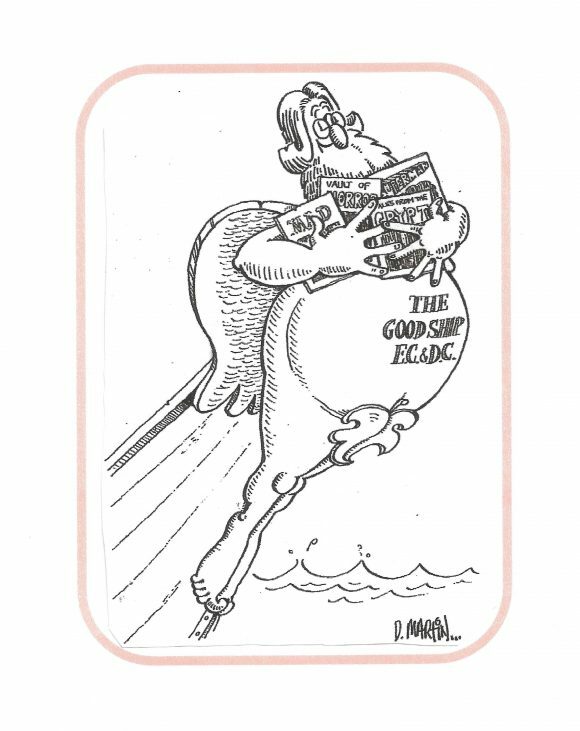 It is sad when a loss could have been erased by a bigness of spirit; but that quality was foreign to Bill Gaines, the publisher of Mad Magazine. With fine-art training, I learned to keep on drawing until I got a certain feeling that I wanted to get. 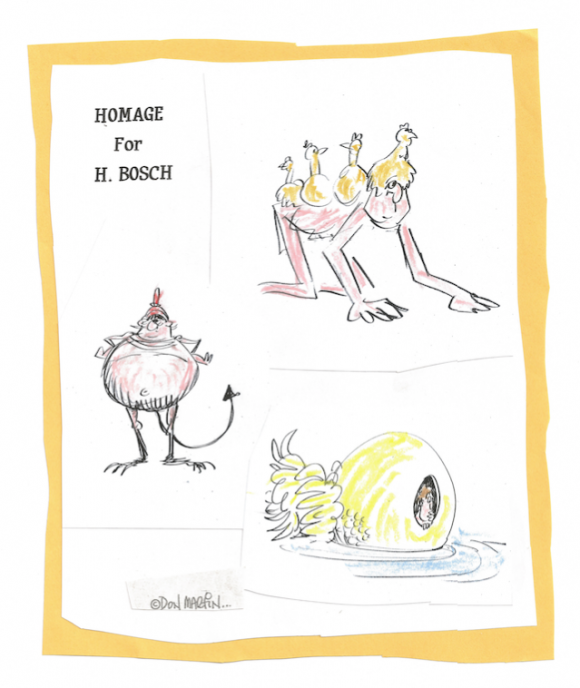 A lot of my work contained grotesque figures like the ones in paintings by Bosch and Breugel. I draw cartoons to be funny. The figures are meant to be comical, that’s why the distortions are the way they are. The long face, the long jaw, the eyes close together, they strike me as being funny and they make me smile. When I write gags, I am also just trying to be funny. My humor is mainly visual humor as opposed to being verbal humor. I don’t usually make much of a comment socially or politically. It’s a silly sense of humor. Doors slamming in people’s faces are fun. Pies in the face are fun. The only test I know when it comes to cartooning is not whether it’s sick, or whether it’s going to ruin people’s values or morals. You only have to ask a simple question: Is it funny? 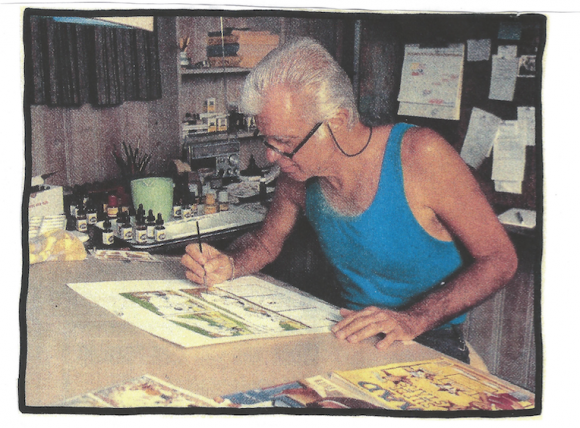 Excerpt from a letter to fellow Mad legend Sergio Aragones, April 1988: “I’ve been working hard on a number of projects and doing a lot of advertising– Perhaps you’ve seen a couple of things. It especially feels good being on my own and not giving my roughs and everything I do to Bill Gaines. I don’t know how or why I did it for so long. Ideas are worked out from sketching, doodling, from looking at lists of things, encyclopedias, phone books and (published) cartoons. I sketch each panel on a separate sheet of paper, because you can edit, substitute, put in panels or take them away. You get a better feeling for timing between panels, because each panel is like a little surprise. I work about six or seven hours every day. I am a compulsive worker. I erase a lot. I’m a perfectionist and even when I know I’m getting too fussy, I’ll erase again anyway. I have never tried to hack anything out. I can draw eight hours a day, but I can waste weeks looking for ideas. When I started in the 50s, sick humor was just coming in and it had to do with people getting mutilated. I did a lot of those kinds of gags. That kind of humor has been around a long time in animated cartoons. And there has always been physical suffering in comedy. Even ancient clowns kicked each other in the seat of the pants. Being a moody kind of kid my early work has a certain kind of tenseness and anger in it, sick humor was what I was considered to be doing. Even the people at Mad, they called me Mad’s maddest artist. They thought I was kind of wild. I didn’t think so. I thought I was being funny. That’s all. My sources were the things I used to look at and to laugh at as a kid. That’s all. I think I’m a very regular fellow. I just draw this way. First off — I hear the sounds in my heads. I started creating them a few years after my career (at Mad) began. They seemed more expressive of the kinds of things going on in my cartoon panels. To come up with the spelling for a sound, I say it over a couple of times and then I write it out. There are wet sounds and hard sounds. Somebody being hit on the head with a brick would sound different than someone being hit on the head with a dead fish. A dead fish would have an ‘S’ in it, Splap or Schlap. A brick would have ‘B’ or ‘P’ in it, Pwak. Writing a sound is easy for me because they make some kind of sense. Actually, the sounds are the written equivalent of the comic sounds of silent movies or animated cartoons. UPDATED 5/18/17: BUT THAT’S NOT REALLY ALL! 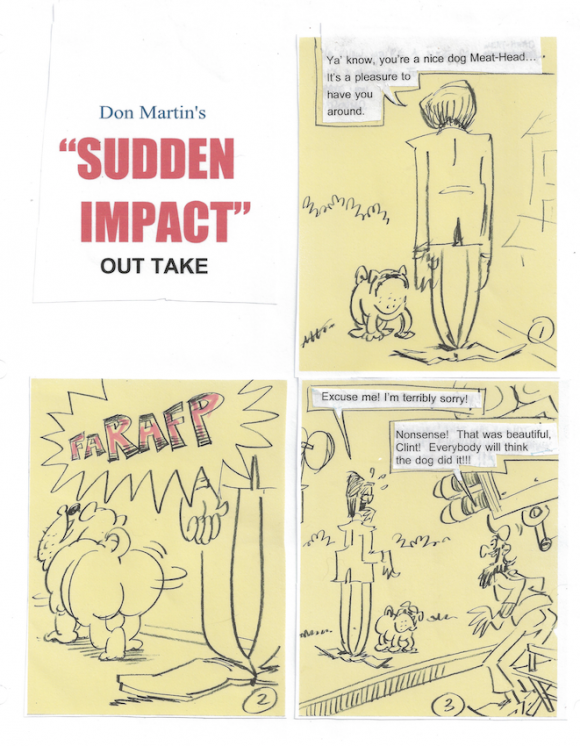 Norma Martin writes about Don Martin’s quixotic quest for newspaper-strip glory, here. 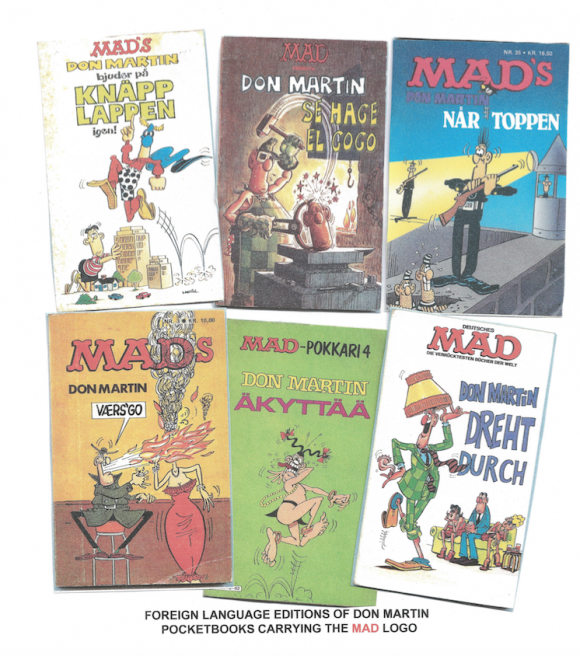 I remember spending hours of my youth reading Don’s stuff and drawing his characters all over my school books. It was my favourite part of MAD magazine. Floobadoop. He was THE MAN. 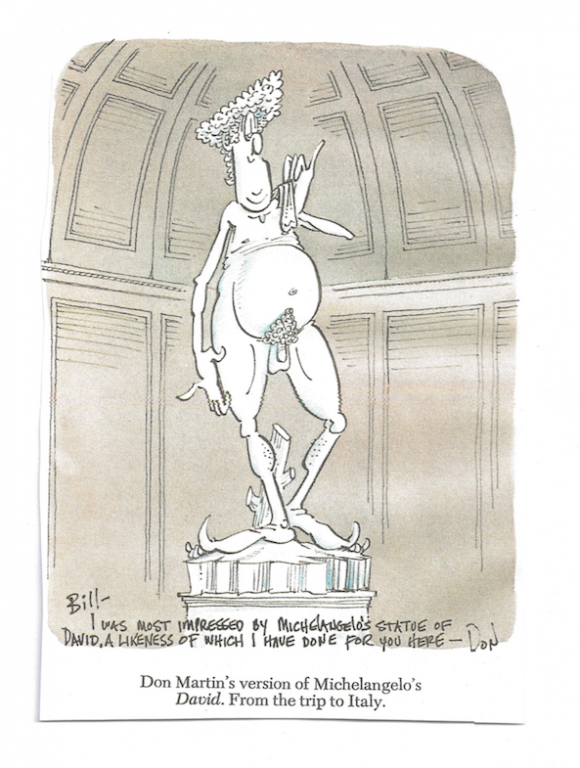 Happy Birthday Don Martin. Thanks for making me laugh at these years. 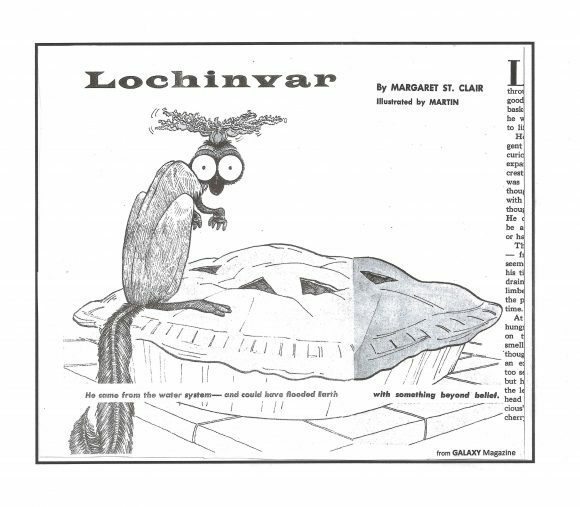 Big thanks to Norma Martin for her continual support of her late cartooning husband. Thanks 13th Dimension. Gil Kane, Don Martin and Charles Schulz all died within a short period of time: a tragic few weeks for comics. Nick Meglin once wrote a textbook about cartooning. He featured the techniques of eight different artists (Al Jaffee, Jules Pfeiffer, etc.). Mind you this was the technical details of penciling, inking and shading, not really their art styles. Students loved the book, but asked why Meglin didn’t outline Don Martin or Charles Schulz. Meglin explained that he did not want students imitating other artists’ styles; only to understand the mechanics of drawing. Meglin had made it a point not to feature Martin or Schulz, simply because he had considered them the most unique cartoonists who ever lived. Whereas an expert like Wallace Wood could flawlessly imitate any other artist (“I could do a great [impression of] Alex Raymond,” he claimed), Meglin thought that nobody could quite capture the Martin or Schulz style. This was spot-on. 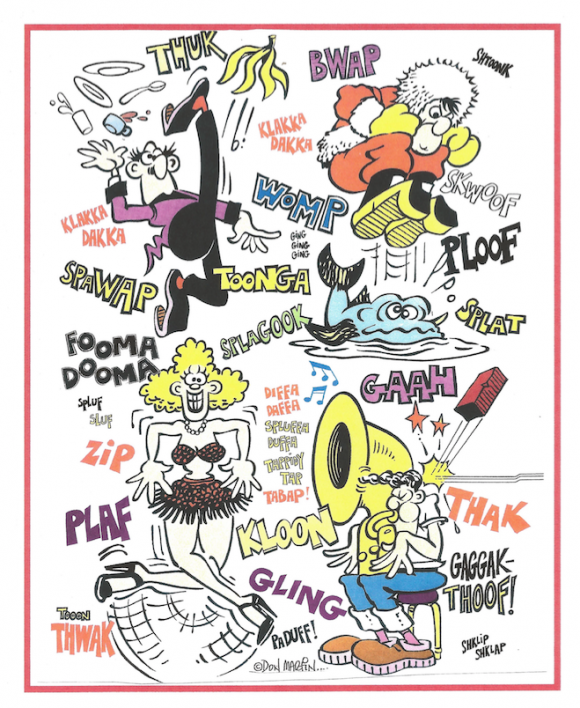 Other MAD artists tried to imitate them: Bob Clarke specialized in doing “Peanuts” articles, and Mort Drucker even did a Don Martin-type character in the satire “Star Blecch.” (Perhaps they had tried to collaborate, but it didn’t work out.) At any rate, artists who tried to imitate Martin and Schulz could do it decently; but anybody could tell it was a cheap imitation. 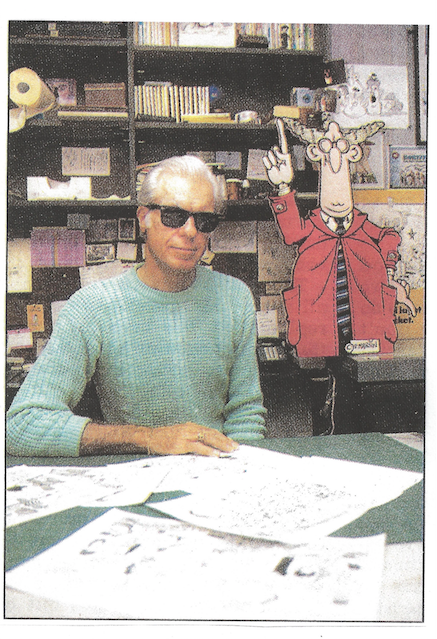 Neither Don Martin nor Charles Schulz had been the very best cartoonists; but they were undoubtedly the most unique. I think Don Martin was the funniest cartoonist in a hundred years (and before). He understood humor in the great burlesque tradition. His is not humor in a jugular vein, but gut-busting laugh-out-loud humor. 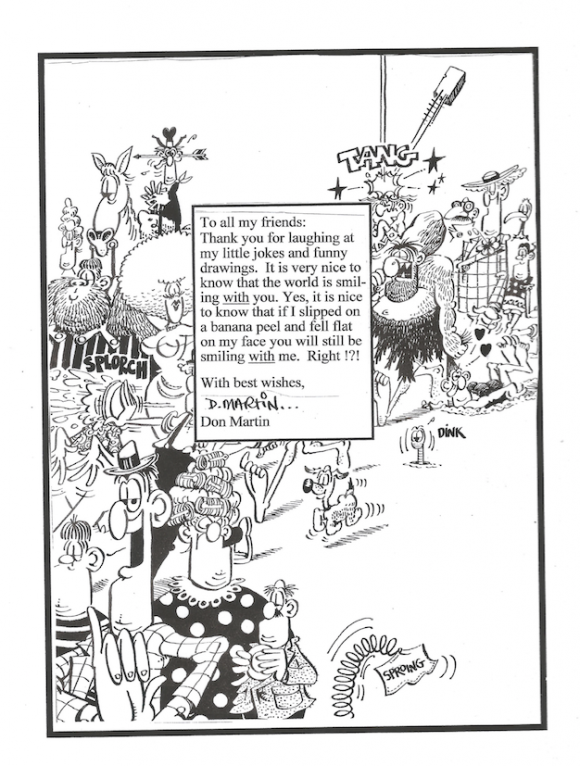 I often wondered why Don Martin had seldom written his own gags. If you really study his work, you can tell which gags had been written by him, and which gags had been written by someone else. (The “eye” jokes were obviously all his.) I have always thought it was fairly easy to draw on one’s own experiences, and knowledge, and put a humorous spin on them. Sometimes, Martin actually did this (i.e., “Piggyback, da-da, piggyback!”), but I was surprised that he hadn’t tried to do it more often. Perhaps he put so much effort into his visual humor, he didn’t have much gas left for verbal humor. I loved his work when I was a kid. He’s the only cartoonist whose work made me laugh out loud. I knew little about his personal life or way of working so this loving tribute was really great. He’s missed. The MADdest of the mad … we would go to Don’s work FIRST when we got our hands on a MAD mag.. 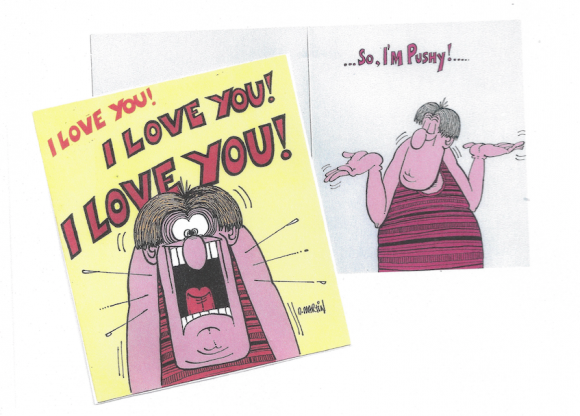 I became a cartoonist because I was inspired by Don Martin. Thanks Don! One thing I don’t understand: Martin hinted that Bill Gaines had been something like a plantation slave-owner, while he [Martin] was a sort of sharecropper-cartoonist, and that he “had” to show all his work to Gaines first. Yet other MAD artists had done other things on the side, while continuing to work for MAD: George Woodbridge did illustrations for history books; Jack Davis and Bob Jones worked in advertising (Jones even came up with the famous “Put a Tiger in your Tank” ad campaign for Exxon, and Davis created the bugs in the Raid commercials); Paul Coker had been an animation director for Rankin-Bass Productions. Why didn’t Martin do the same thing? (If he did, I haven’t seen much of it, and I figured somebody with his talent would have been highly in-demand.) The only reason I can think of is that, for him, drawing was such a grueling and painstaking process, he couldn’t put out as much work as those other guys. David–I just noticed your other two comments and will address each one. Then on October 8, 2017 your comment discussing gag writing ended with: “Perhaps he put so much effort into his visual humor, he didn’t have much gas left for verbal humor.” OK–Let’s keep in mind there are two things here–drawing and writing. Your position earlier established that you think Don is not (drawing) the very best cartoons, and now you are stating that Don didn’t write every single one of his gags. Really–so what? When Don started writing his gags they were infused with his sense of humor. 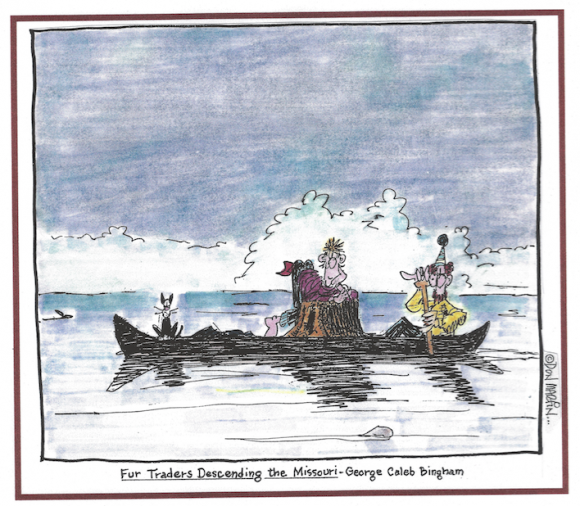 Check out the website listing all the MAD Don Martin gags and you will find 80% or so were by him. But it doesn’t really matter. Why? Because once a person’s humor/shtick is formulated its his/hers. And Don didn’t mind other people writing gags for him. Why do you suppose you do? Grow up. Schulz was one of the few cartoonists who didn’t have an army of writers. Now, how many bosses hearing this would probably smile and be thinking— Jerks! You made me a multi-millionaire! !